Sixty-two-year-old Hannah Claxton died this date, October 29th, in 1848 and was buried at Bethel Burying Ground. Sixty-two-year-old Hannah Claxton died this date, October 29th, in 1848 of a “Uterine Hemorrhage” and was buried at Bethel Burying Ground. She was employed as a “pastry cook” earning $6 a week, according to the 1847 Philadelphia African American Census. Ms. Claxton, a widow, lived in a room at 22 Ball Street for which she paid $6 a month, one week’s earnings. Six dollars in 1848 is equivalent to approximately $174 in 2018. Ms. Claxton (red arrow) lived close to the Shippen Street Market (green arrows). Shippen Street is now named Bainbridge Street It was a two block long open-air market with stalls and was the center of the local neighborhood. It is likely that Ms. Claxton sold her baked goods there or she provided them to a huckster or vendor. It was a highly unsanitary place to live near. There were constant complaints to the Board of Health concerning the piles of rotting vegetables and spoiled meat that were thrown into the streets by the market’s vendors. After the businesses closed for the evening, the sheds became home to locals gangs who would terrorize local citizens. Ms. Hannah Claxton was laid to rest on an autumn day that began cool and with the temperature rising to an unseasonable 68 degrees by 2pm. Seventy-five-year-old Roland Lewis died this date, October 27th, in 1844 and was buried at Bethel Burying Ground. Seventy-five-year-old Roland Lewis* died this date, October 27th, in 1844 from the effects of diarrhea which was a symptom of an undiagnosed illness. In the 1836 Philadelphia African American Census, Mr. Lewis reported that he was employed as a laborer and his spouse as a cook. Ms. Lewis’ name was not recorded, however, I believe it to be Tabatha Lewis. She passed away on February 4, 1843, at seventy-two-years-old of “Inflammation of the Stomach and Bowels” and was buried at Bethel Burying Ground, according to Philadelphia Board of Health death certificates. Above is a snapshot of the Lewis family’s entry in the 1836 Philadelphia African American Census. The entry continues to report that Mr. and Ms. Lewis were born into enslavement and were freed through manumission. The elderly couple lived at 75 George Street on the same block as the Philadelphia Looking Glass and Picture Frame Company, the Sewing Machine Manufacturing Company and a jar and can sealing factory. George Street no longer exists. It is now covered by a Thomas Jefferson University Hospital building. The red arrow above points to the approximate location of the Lewis’ home at 75 George Street in center city Philadelphia. *”Roland” is occasionally spelled “Rowland” in some documents. On this date, October 25th, through the years. There are times I cannot find biographical information on individuals, beyond what is on their death certificates. No matter – they rightfully deserve to have their names said out loud. Eight-year-old Sarah Moss died from burns on October 25, 1820, and was buried at BBG. Her mother was Phoebe Moss. Twenty-five-year-old William Morris died from Tuberculosis on October 25, 1826, and was buried at BBG. One-week-old Baby Burneck died due to convulsions on October 25, 1828, and was buried at BBG. The child’s father was James Burneck. Thirty-year-old Mary Pennock died of Tuberculosis on October 25, 1846, and was buried at BBG. Two-year-old George Henry Harvey died due to convulsions on October 25, 1850, and was buried at BBG. 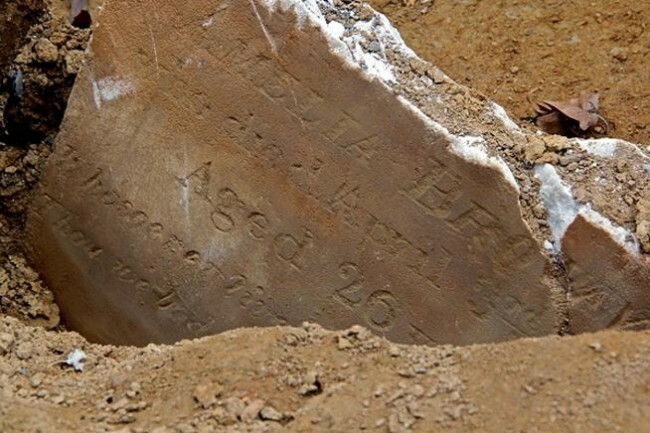 One-hundred-year-old Sarah Stephens died this date, October 16th, in 1848 and was buried at Bethel Burying Ground. One-hundred-year-old Sarah Stephens died this date, October 16th, in 1848 of kidney disease and was buried at Bethel Burying Ground. Ms. Stephens worked as a seamstress, according to the 1847 African American Census. She was born in Albany, New York in 1748 during the time the Dutch settlers of Albany were still engaged in warfare with the union of Native Americans, known as the Six Nations. Enslaved Black men and women were reported to be in Albany as early as 1697. They were readily available to Dutch merchants and farmers because the settlement was on the Hudson River with easy waterway access from New York City. It is likely that Ms. Stephens was an ancestor of these early enslaved people. On March 14, 1794, two young enslaved girls were hanged in Albany, N.Y. One was named Dinah, aged 14. The other was named Bett, just 12. A month later, a 16-year-old enslaved male named Pompey was hanged. All were accused of inciting rebellion. Sarah Stephens lived with the Kennedy family in what was the southwestern part of the unconsolidated city at the time of her death. Robert and Liddey Kennedy, both 28 years of age, lived at #7 Gulielma Place with their two children, Robert R. (4) and Elizabeth (3). Both adults reported that were employed as musicians and house painters (whitewashers), according to the 1847 Philadelphia African American Census. There is no indication in census records of the blood relation, if any, with the Kennedy’s. Mr. Kennedy was born in Maryland while Ms. Kennedy was born in Delaware, according to the 1850 U.S. Census. The first map shows the location of the Kennedy/Stephens home on a map of the time period. The second map shows the location in the city. Gulielma Place is now known as Naudain Street. Sadly, the Kennedy’s lost a five-month-old daughter to intestinal disease in May of 1842. She was buried at Bethel Burying Ground which may have had something to do with Ms. Stephens also being interred there. Ms. Stephens was buried on a cloudless Autumn day where the temperature rose to 76 degrees by late afternoon. Six-month-old Thomas Summersett died this date, October 10th, in 1812 and was buried at Bethel Burying Ground. Six-month-old Thomas Summersett* died this date, October 10th, in 1812 of “Summer Complaint” (Cholera) and was buried at Bethel Burying Ground. John Summersett was the child’s father. There is no available information on the child’s mother. Mr. Summersett worked as an oysterman. Many white historians and artists have represented these Black men and women who labored in this profession in an old-time romantic light. It was a racist image of a happy go lucky “darky” who would sing while hawking his or her goods. The reality was quite different. Oysters were the fast food of the 18th and 19th century. The oyster vendor above has forks, plates, and condiments available for her customers. Her income would not have been steady because of the weather and the seasonal availability of the oysters. All Black vendors, regardless of their wares, were subject to violent attacks by thieves and white gangs. There was nothing remotely romantic or nostalgic about what these men and women had to go through just to live in poverty. It is likely that Mr. Summersett was one of the “Black Warriors.” In 1812, there was a looming threat of the British invading Philadelphia. The Engineer Corps of the U.S. Army requested assistance from the Black citizens of Philadelphia in erecting ramparts or breastwork on the west side of the Schuylkill, near Gray’s Ferry. The African American community’s response was robust. Black religious leaders Richard Allen and Abasolon Jones organized a company of at less a thousand Black men. Some estimates go as high as 2,500. The above is a present-day photograph of Small Street (now Kater Street) in South Philadelphia where the Summersett family resided. The street was near an outdoor market. Consequently, there was a large number of residents employed as grocers, cake bakers, fishmongers and biscuit makers. The Summersett family buried their six-month-old son on an autumn day in 1812 at Bethel Burying Ground. Historical Note: On this date, October 10th, in 1887 there were two separate nuisance complaints filed against Bethel AME Church for the lack of upkeep of Bethel Burying Ground. Thirty-nine-year-old James Johnson Richmond died this date, October 3rd, in 1853 and was buried at Bethel Burying Ground. Thirty-nine-year-old James Johnson Richmond died this date, October 3rd, in 1853 of Tuberculosis and was buried at Bethel Burying Ground. He was employed as a shoemaker at the time of his death. However, three years earlier he worked as a waiter earning $7.50 a week, which was almost double of what the normal income for the average Black man in the same occupation. Mr. Richmond was married to Charlotte Richmond who was thirty-three at the time of her husband’s death. She was employed as a laundress, according to the 1847 Philadelphia African American Census. The Richmonds had two sons, John and Peter, who were nine and seven years old respectively at the time of their father’s death. They lost another son Robert on November 4, 1851 to Tuberculosis when the child was eighteen-month-old. He was buried at Lebanon Cemetery. The parents and children were all born free and in Pennsylvania. The red pin indicates the location of the Richmonds’ home at 417 N. 4th Street. The Richmond family lived in a northern district of the county of Philadelphia called “Northern Liberties.” They lived in a room at 417 N. 4th Street, a heavy industrial neighborhood, for which they paid $1.75 a month. The children went to local schools for Black children. Dunlap’s Phoenix Carriage and Coach Manufacturing Company was located a block away from the Richmonds’ residence. The disease that took the lives of Mr. Richmond and his son Robert was a product of cramped and unventilated living conditions. Tuberculosis was responsible for taking more lives than most other diseases combined. Below are several photographs of the actual alleys that existed near the Richmond family’s home. Ms. Charlotte Richmond and her children buried their husband and father on an autumn day in 1853 at the Bethel Burying Ground.